President Mary McAleese has said this is a time of profound transformation in Northern Ireland as citizens of all politics and persuasions gather behind the remarkable momentum of the peace process and work together to form one reconciled community out of two divergent traditions. She said the once-fraught cross-border relationship was now characterised by a growing good neighbourliness and co-operation. Ms McAleese said that 'peace is not perfect' and has its would-be wreckers, as well as the predictable challenges that come from delivering effective government using a radical new model of power-sharing. However, she said all around there was evidence of the growing benefits that come from the resource of dialogue and collegiality in the civic, commercial and political spheres. Ms McAleese was speaking in Belfast during a visit to the annual Balmoral show at the King’s Hall. 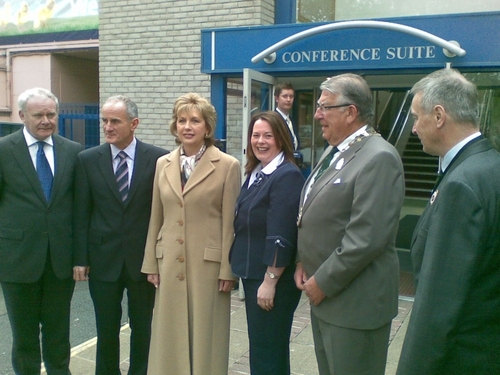 She was welcomed by the Northern Ireland Deputy First Minister Martin McGuinness and Northern Agriculture Minister Michelle Gildernew, who hosted a breakfast before accompanying the President on a visit to some of the stands including some from companies in the Republic as well as the NI Executive. In her speech Ms McAleese said the agricultural industry was the absolute backbone of the entire island.